Unless you’ve been living under the proverbial rock, you’ve probably seen the inventive designs of Dedri Uys, especially her amamani patterns, over the past year. Dedri is a U.K. based crochet designer, blogger, and author, as well as a radiographer. I’m excited to share an interview with her today as part of a series highlighting crochet designers for (Inter)National Crochet Month. Dedri can be found online on her website, Look At What I Made, on Facebook, Instagram, Pinterest, and Ravelry (as BabertonDaisy and on her designer page). All images are copyright Dedri Uys and used with permission. Dedri: My granny (on my dad’s side) taught me to crochet when I was knee-high to a grasshopper, and although I was good at it, I didn’t particularly like it. It wasn’t until I was pregnant with my second son 5 years ago that I picked up a hook again. Dedri’s squares from the Block a Week CAL 2014. You can find links to the patterns and more here. Dedri: I soon realize that I couldn’t find that many crochet patterns aimed at boys, at least not toy patterns. So I decided to design some of my own. My first designs were rudimentary to say the least. They consisted of a Little Blue Car, a Crochet Tractor, and a Digger-loader. Then one day my mom’s friend sent me a picture of a fabric puzzle ball. I was too lazy to get the sewing machine out, so I decided to crochet one instead. And that was it! Every time I started another design, I would think of 5 more things I wanted to design. It was never a conscious choice. The ideas just don’t seem to stop. The puzzle ball, and the resulting animals, were definitely the reason my crochet went from hobby to obsession. Star Ball, a free Amish puzzle ball crochet pattern by Dedri Uys. 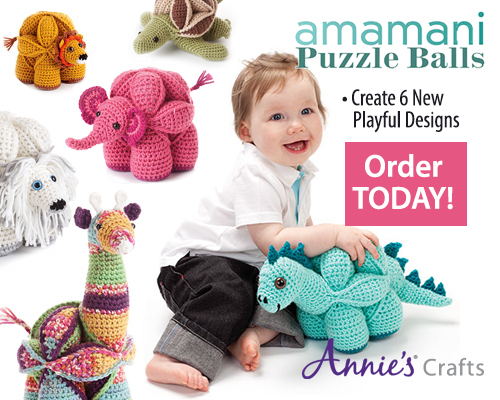 UC: Although there is a lot of variety in your designs, you are definitely well know for your Amish puzzle patterns, such as the ones included in your first book, Amamani Puzzle Balls. Can you talk about how you got started making these and what you enjoy about creating these designs? Dedri: The Amish Puzzle Ball is a crochet version of the traditional Amish Puzzle Ball and comes apart into 3 segments, or rings, which have to be assembled to form the ball. There is also a Flower Ball and a Star Ball. These balls soon gave birth to a small menagerie of puzzle animals (Amamani), and my first book, Amamani Puzzle Balls, features 5 of these animals. These patterns usually cause a roller-coaster of emotions. There is often frustration – the wedges can be a tad boring. It’s like eating your veggies before you are allowed your pudding. And finally there is delight when the animal is built! This delight is what I love most about making the puzzle balls. And it is not limited to the person actually making it. I love nothing better than taking one of these apart and then shoving it at someone, going: “Build it!” I love watching their faces as they go through the whole gamut of emotions again. Shorn the Sheep, a free crochet pattern by Anette Bak and Dedri Uys. UC: Most of your designs are self-published, but you also have a book published by Annie’s. Do you plan to continue keeping a variety between self-publishing and third-party publishing, or do you prefer one over the other? Dedri: I love the freedom self-publishing gives me. By that I mean that I am not limited by word-count and my instructions can be as informal and chatty as I like. This is a huge bonus as I have had a lot of good feedback about my chatty style, and people have come to expect it of me. It is also easier to amend errata if you are self-published. Having said that, there is something so exhilarating about a real book…with your name on it! And there is just no way that I would have been able to promote self-published patterns to the same degree. Also, the book looks so much more professional than I would EVER be able to achieve on my own. So, despite having to compromise on how the patterns are worded, I much prefer third-party publishing to self-publishing. From the free Sophie’s Universe CAL by Dedri Uys. UC: You’re currently hosting the Sophie’s Universe mystery crochet-a-long. Tell us about it and how people can join in. Dedri: Lately my focus has shifted a bit and I now put my energy into tutorials more than patterns. The patterns I do write are very photo-intensive and my hope is that I will be able to provide not just patterns, but “learning journeys”, if that makes sense. Sophie’s Universe is a case in point. It is based on Sophie’s Garden, which was, in turn, inspired by Chris Simon’s Lace Petals Square. Sophie’s Universe is a 20-week mystery crochet-along that will yield a continuous square blanket. The pattern is written as a step-by-step photo tutorial, specifically aimed at advanced beginners. The idea is that people will not only be able to make something that they initially perceived as too complicated, but that their confidence and understanding will grow in the process. I want people to feel good about the items they make. More importantly, I want them to enjoy making them! The “Parts” are released each Sunday as step-by-step photo tutorials with plenty of hints and links. The size of the final blanket will depend on the yarn and hook you choose to use. I am using Scheepjeswol for all 3 of my “sizes”. Lazy Waves, a free crochet pattern by Dedri Uys. Dedri: I am inspired (and energized) by colours. Any colours. Any combinations. The more the merrier. Cable Stitch Dishcloths, free crochet pattern by Dedri Uys. Edie Eckman’s Connect the Shapes Crochet Motifs: Creative Techniques for Joining Motifs of All Shapes; Includes 101 New Motif Designs . UC: Do you have any crochet/crafty blogs or websites you visit regularly for inspiration or community? Dedri: My favourite blog is The Purl Bee. (UC comment: I reviewed the Purl in my Visitor’s Guide to New York City Yarn Shops.) Hands down. It is a multi-craft site and the projects they share on it are amazing! Some of their pieces are monotone, some of them are all white, some of them have more colours than smarties used to have when we were little. I spend hours just looking at all the beautiful knit/crochet/sewing creations. Edward: Circus Elephant Lovie, a free crochet pattern by Dedri Uys. UC: How are you celebrating NatCroMo this year? Thanks so much for stopping by, Dedri! I look forward to seeing how Sophie’s Universe turns out! Thanks so much for taking the time to share your story, Dedri! I know you are a busy lady, so I really appreciate it. Thank you for another wonderful interview! I am so proud of you, Dedri. The tutorials are the clincher: they are well presented and clear. I am totally hooked! Thanks for stopping by, Minette! I love Dedri’s tutorials as well. That is a great story to hear, Liz! I think that a mark of a great teacher, like Dedri, is helping the students to go beyond what they expect! How nice to hear from Dedri like this! Makes us feel even a little closer to her than we already do! Wow, thanks so much for sharing your passion for crochet and your high compliments for Dedri, Tracy!